In 2002, a team of Boston Globe journalists exposed a massive cover-up in the Catholic Church designed to protect priests accused of child molestation. The scandal led to the resignation of Boston Cardinal Bernard Law and multiple settlements by the Catholic Church to victims of abuse. The series of articles exposing the Church earned the journalists — known as the Spotlight Team — a Pulitzer Prize in 2003. That was over 10 years ago, and now the Spotlight Team is ready to take center stage as the subject of a new movie fittingly named Spotlight. The film, out Nov. 6, stars Mark Ruffalo, Michael Keaton, Rachel McAdams and more as the hard-hitting reporters, but where are the real Spotlight journalists now, years after they exposed the terrifying scandal? The main Spotlight Team, as seen in the film, originally consisted of four people: Michael Rezendes (Mark Ruffalo), Sacha Pfeiffer (Rachel McAdams), Matt Caroll (Brian d'Arcy James), and Walter Robinson (Michael Keaton). All four members worked together after the arrival of new editor Marty Baron, played by Liev Schreiber, and continued to collaborate even after the 2002 series. Over the course of the Spotlight Team's investigation, Rezendes and Pfeiffer worked as the main investigative reporters, with Caroll working the data — keeping track of all the priests involved, victims, etc — and Robinson acting as editor. All of the members of the Spotlight Team have publicly supported the film, whether by writing personal essays on their experience being reflected onscreen for the Globe, or by attending screenings. But they are far from living in the past. Most of the Spotlight Team members have continued to take part in award-winning journalism, whether at the Globe or elsewhere. Here's where the Spotlight Team members are now. Where He Is Now: Rezendes still works on the Boston Globe's Spotlight Team, where he is the only remaining team member from 2002. He recently investigated the treatment of mental health patients in state prisons, and has continued to write about sexual abuse in the Catholic Church. 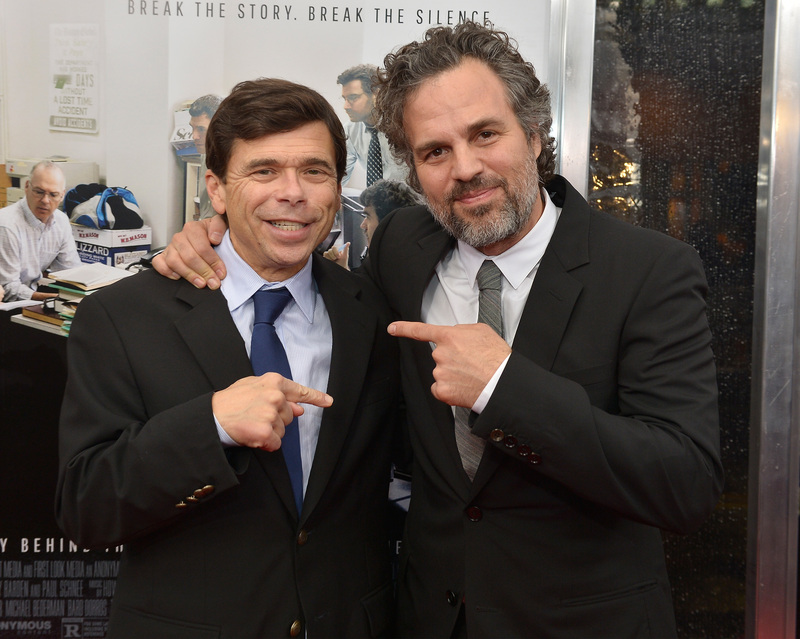 On Mark Ruffalo: During filming, Rezendes wrote for the Globe, "Mark introduced an odd, closed-mouth chuckle I didn't even know I used but which former Spotlight reporter Sacha Pfeiffer insisted was eerily accurate." Where She Is Now: Pfeiffer spent five years as part of the Spotlight Team at the Globe before leaving to work at Boston's NPR station, WBUR, where she reported and hosted All Things Considered and Radio Boston. She also hosted NPR's Here & Now and On Point. Pfeiffer has recently returned to the Globe as a reporter. On Rachel McAdams: When Pfeiffer and McAdams first met, Pfeiffer wrote in the Globe, "Rachel told me she'd been working to mimic my rapid pace. Eventually, though, it was decided that if she spoke on screen like I do in real life, she'd be too fast for the audience to understand!" Where He Is Now: Robinson was editor of the Spotlight Team for seven years and still works at the Boston Globe. Robinson is currently Editor At Large at the paper, and just completed a seven-year run as a Distinguished Professor of Journalism at Northeastern University. On Michael Keaton: "My persona has been hijacked. If Michael Keaton robbed a bank, the police would quickly have me in handcuffs," Robinson wrote for the Globe. Where He Is Now: After winning the Pulitzer Prize with the Spotlight Team, Carroll remained at the Boston Globe as a reporter until 2014. Carroll currently works as a researcher at the MIT Media Lab. On Brian d'Arcy James: "I just wanted someone who was better looking than me, which frankly is not all that difficult," Carroll said in an interview with Boston.com. "He looks great. I keep telling people he does me better than I do me." As the Spotlight Team members continue their work in journalism, there's no doubt they deserve a little piece of Hollywood history.